THE RUSSIAN JOURNALIST who worked with Ukrainian authorities to fake his own death has said that the elaborately staged murder included getting smeared in pig’s blood and taken to the morgue. 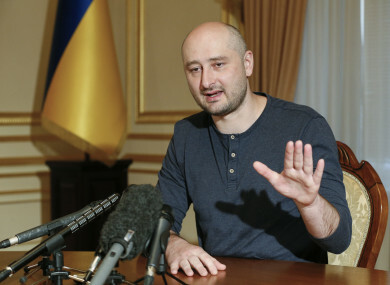 Arkady Babchenko detailed the deception to fellow reporters for the first time since Ukrainian authorities revealed yesterday they arranged to make it look like the Kremlin critic was shot dead to foil an alleged plot on his life by Moscow’s security services. Babchenko (41) said at a press conference in Kiev that he could have refused when Ukrainian security service officials approached him with the idea for the ruse about a month ago, but readily agreed. The Ukrainian agents told him the Russian security services had placed an order for his slaying the month before that, said Babchenko, who fled Russia in February 2017 because of what he described as death threats. “I said: ‘Great, why have you been waiting for a month?’” he recounted. Kiev police reported on Tuesday that Babchenko, who settled in Kiev in the fall and worked as a host for the Crimean Tatar TV station, had been shot inside his apartment building and discovered there by his wife. Police said he died on the way to the hospital. The next day, during a press conference to discuss the killing, Ukrainian Security Service chief Vasyl Gritsak revealed that Babchenko was alive by inviting him into the room, stunning fellow journalists. Babchenko said even his wife had believed he was dead. Gritsak also said a Ukrainian citizen who allegedly was paid $40,000 (€34,200) by the Russian security service to organise and carry out the hit had been arrested. The man in turn allegedly hired an acquaintance to be the gunman. Today, Babchenko described what a makeup artist and security officers did to make the staged murder look genuine. The security officers took his sweatshirt and shot it through with a gun. Babchenko said he put on the shirt and got smeared with pig’s blood. He was taken in an ambulance to a hospital intensive care unit, where a forensic expert officially “documented” his death. After that, he ended up in a morgue. Babchenko said he was worried the entire time the operation would fall through, but was relieved after it was completed. “I only stopped being afraid at the morgue,” he said. Email “'Dead' Russian journalist faked his own death with pig's blood and trip to morgue”. Feedback on “'Dead' Russian journalist faked his own death with pig's blood and trip to morgue”.